Donald Robertson gazes past the pool of the Sunset Tower Hotel, tap-tap-tapping away on his iPhone. “It doesn’t matter if anyone’s late anymore,” he says, “this thing always has something to keep me busy.” Like his drawings, Robertson, 53, projects a somehow glamorous sense of being hurried, like someone running to a catch a subway dressed in Saint Laurent. He shapeshifts. Officially, he is the senior vice president of global creative development for Estée Lauder. But in practice, he is an artist and illustrator, connector, and collaborator— his latest joint venture is with the Chelsea boutique Story, a “takeover” that opened in August and runs through Sept. 18. Stocked on the shelves is an assortment of Robertson’s art and accessories bearing his art (and, at some points, Robertson himself). Robertson started on a more clear-cut path. He attended art school in Toronto, his home- town, but was deemed “too commercial” and got asked to leave after suggesting that he and his classmates sell their sketches instead of crumpling them up and throwing them away. 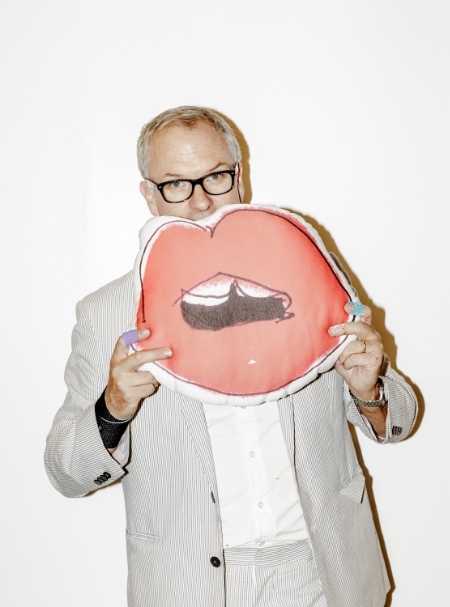 He took off for Paris in search of illustrator gigs, and when that proved fruitless, returned to Toronto and linked up with the founders of MAC Cosmetics, who brought him on as their first creative director. He accepted a job at Condé Nast, he admits, largely to get a green card, and served as a creative director there as well as at Hearst. All the while, he sketched: figures, lips, faces, even stuff he’d assign at the office. “If you were going out to do a fashion story for me, you were handed an eight-page drawing, and I was like, ‘Please make it look like this,’” he says. Three years ago, when his kids made him ditch his Blackberry for an iPhone, he joined Instagram as @drawbertson and started sharing his cheeky, pop art-y sketches. The world lapped them up. He has collaborated with J. Crew on a line of T-shirts and is releasing his own collection of emojis. Last spring, he invaded Manhattan’s Bergdorf Goodman, painting passersby “like an in-store Santa” and putting his signature scrawls on a whole host of merchandise, including an Alice + Olivia blouse and Claire V. clutch that Beyoncé’s styl- ist bought. Beyoncé did a photo shoot with the products for her Tumblr.